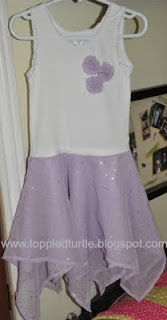 I followed these instructions for making circle and pixie skirts. 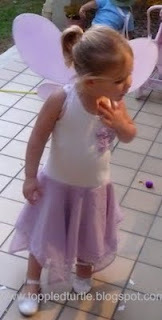 I make 2 pixie skirts for the body of the skirt and 1 circle skirt for the lining. I did a quick hem on the bottom of the pixie skirts and a simple overlock on the bottom of the lining. 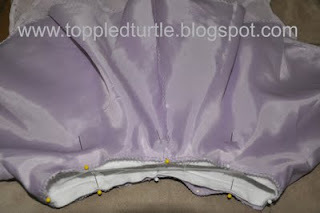 Then I sewed all three layers together at the waist using an overlock stitch (making sure the orientation of my 2 pixie skirts were askew to create multiple "peaks" at the hemline). For the bodice, I purchased a set of girl's undershirts (it doesn't get an easier - or cheaper - than that). Then I lined up the waistband of the skirt with the waist of the shirt. I turned the shirt inside out and slipped the shirt (right side out) into it. For this step, it is important that the right sides face each other. If you're not sure you've got the orientation right, then pin it and carefully open it up to see what you've got. I then sewed them together just above the hem on the shirt (so that you can't tell its a separate finished shirt once its all sewn together). 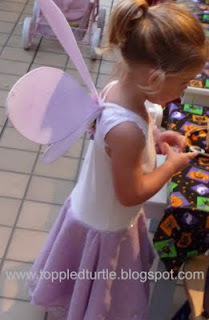 Then, I took scraps of fabric from the pixie skirt and made 3 yo-yos using one of those cool yo yo gadgets and hand sewed them onto the bodice. And, after a couple hours of work, viola! 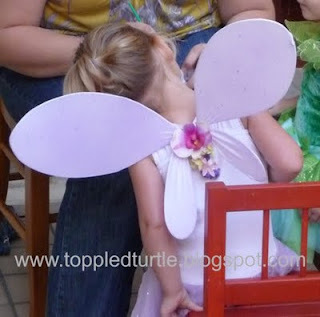 Everyone knows you can't have a fairy costume without wings. I found this wonderful tutorial. Now, I just do not have the time to run to 3 stores to get supplies, so I just went to Michaels and Target. I couldn't find the wire I needed at Michaels, so I ended up using some wire hangers we got back with our dry cleaning. 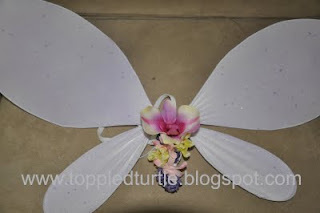 Instead of electrical tape, I used white floral tape. I scored some glittery tights at Target which saved me a step also. 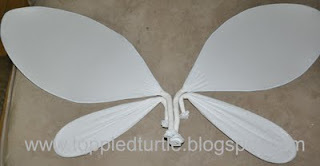 I found it easier to bend the stems of the wings into the approx angle prior to continuing. I found some cool fabric spray paint (pump) by Tulip that dried super fast and made zero mess. 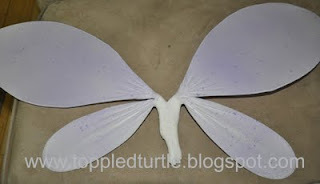 I just stepped outside, held each wing by its stem, and sprayed both sides, then hooked them onto my table to dry (a huge benefit of bending the steps earlier in the process).